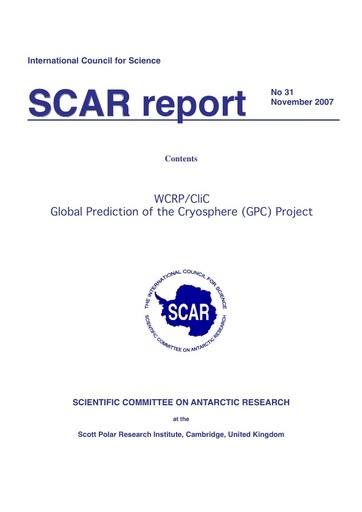 Global Prediction of the Cryosphere (GPC) is one of the four themes of the CliC project and has the goal of improving the model projections of the global cryosphere over the 21st century. While each of the other three CliC themes has some elements of cryospheric prediction, GPC is closely linked to the climate modelling and meteorological communities, and has a strong focus on the atmospheric and oceanic forcings of the cryosphere. proposing research activities in the framework of CliC. The meeting consisted of short invited presentations on the different components of the cryosphere, followed by extensive discussion. John Turner described the functions of WCRP and its various projects and other activities, along with the goals of CliC.